From yesterday: "HM Revenue and Customs (HMRC) today announced it is allocating £45 million to improve customer service, as it released statistics which showed an inconsistent call handling performance in 2014-15". The press release is here. Well it wasn't all that inconsistent, showing a downward trend throughout the year with respite only in the lightest-loaded months. HMRC point out that they "receive more than 60 million calls a year, peaking around key deadlines such as 31 January for Self Assessment, and 31 July for tax credits renewals". Fair enough, but in January 2015 they answered only 65% of calls despite receiving fewer calls than in January 2014 when they managed to answer 88%. 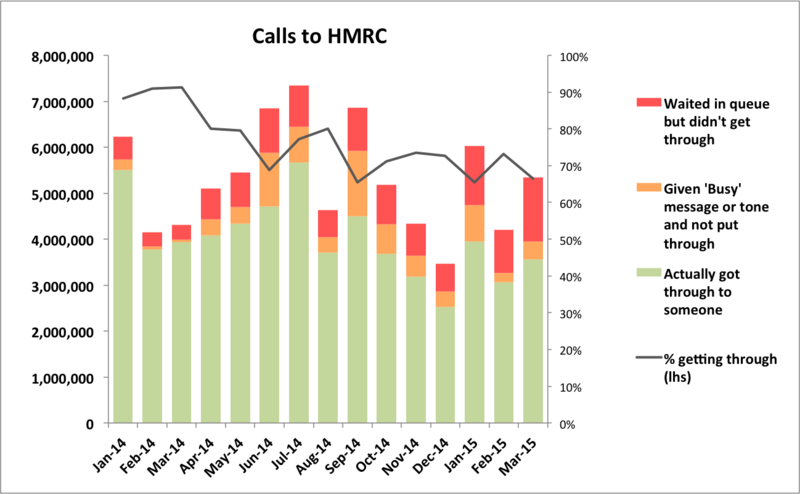 In fact, in the first three months of 2015, HMRC answered only 10.6m calls when in the same period of 2014 they were able to answer 13.2m. The average 'answered' rate for January to March 2015 was less than 68%, compared to HMRC's target of 80%. No explanation at all is given for this marked deterioration, unless Notes for Editors #3 comes straight from the oracle at Delphi - "In 2014 HMRC introduced a new telephone system which allocates calls across the UK network to provide the fastest-possible response time." Whether this system is what was meant when "Ms Homer added: We have also invested in new telephone equipment, which lets us switch calls to many more offices, not just take them in contact centres, so more of our staff can help customers at the busiest times" doesn't explain why HMRC have answered so many fewer calls in the first three months of 2015 than the same period in 2014. Anyway, that money has to come from somewhere, and while we are assured that it comes from the current spending settlement and is not additional revenue from the Treasury, it begs the question (in these straitened times) of what that £45 million had been earmarked for that will now not be done. Reallocating 'around 2,000 staff from other HMRC business areas' might just put the squeeze on those areas to cut a bit more or be a bit more efficient, but 'paying for the recruitment of around 3,000 additional staff this year' has got to hurt somewhere. And from the Oracle to the positively Orwellian, Notes For Editors #5 says "If a call isn’t answered first time, it does not mean that the caller’s issue is not dealt with. Most will call back and get through on a subsequent attempt, or use online services." Not wanting to be personal about this, but if a Perm Sec rang up their bank and couldn't get through would he or she think their issue had been dealt with? Or perhaps more pertinently, if a Minister got no answer when calling the Perm Sec...?